Kundalini Yoga is a Raj or 'Royal' Yoga. For thousands of years its practice was exclusive to the rulers and sages of India for whom it brought greatness and prosperity. In 1969, Yogi Bhajan brought Kundalini Yoga to the western world stating that the time had come for this sacred technology to be available to everyone in order to face the challenges of living with grace and determination at the dawning of the Aquarian Age. By the year 2013, the world's population will be seven billion. The change in technology, psychology and sociology will be huge. The chaos of information in the computer age will make it difficult for people to cope with their day-to-day lives. The body, mind and spirit will have to be organized to meet these natural human phenomena. Every human, no matter to which religion they belong, will face a reality in the future where they will need a strong, healthy nervous system. They will need mental clarity and the backup of spiritual strength to face this coming world. We can say with confidence, the only way to do this is through yogic techniques by which body, mind and spirit can be enhanced. People will see that those who practise yoga are bright and beautiful, calm and blissful. They will recognize that the yogic community is sincere and dependable, serving and giving. Yoga, with its every system, is going to prevail. We clearly see this trend, and it will lead to the end of human insanity and the prevalence of yogic glory. Yoga is a science for all humanity. It is the custodian of human grace and radiance. It holds a great future for every human being. It brings mental caliber for purpose and prosperity of life. The future of Yoga is bright, beautiful and blissful. 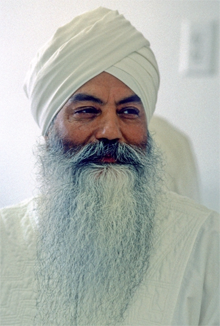 Yogi Bhajan, Master of Kundalini Yoga, Ph.D. Psychology of Communication, taught and inspired thousands of people in the West for 35 years. In 1969 Yogi Bhajan created the 3HO Foundation (Healthy, Happy, Holy Organization) to share the technology of Kundalini Yoga. In 1976 he founded KRI, the Kundalini Research Institute, to which he entrusted the preservation, integrity, and accuracy of The Teachings of Yogi Bhajan.